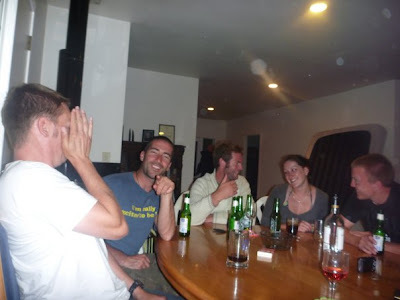 The Life of Brad: December 2009, End of a Decade! December 2009, End of a Decade! 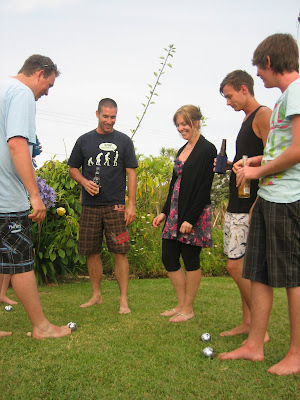 In the month leading up to the end of the decade I stocked celebs at the Premier of "the Lovely Bones", had Christmas with a surogate family and played on the beach in the Coromandel for New Years. 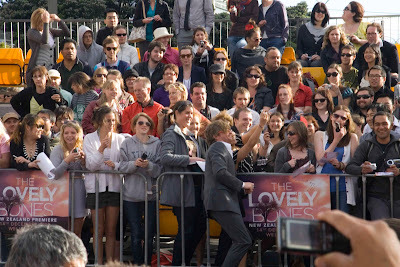 My first look at a Red Carpet Premier was that of "the Lovely Bones" by Peter Jackson in Wellington Monday Dec. 14, 2009. Very cool and exciting. I got a bit caught up in it once all the cameras started firing. I'm not up on the movie, but will see it. The Lovely Bones was filmed in Jan 2008 and actually scooped up some of the better people from AVATAR which continued to film in to Feb/March. For a town of 250,000 people Wellington sure does have some big things happen. Rhys Darby (Murray) of "Flight of the Conchords" fame taking a photo with a local. Christmas, off to Langs Beach 1 hour or so north of Auckland. Shane invited me to join he and Laura and his family up in Langs Beach for Christmas. Lots of family and fun stuff to do. Great beach, fishing attempts, good grog and the food was awesome. Especially Uncle Allan's fresh exotic fruits, custard apples, yes! Thanks for the invite Donna and Warrick and hosting me Brett and Erica. Pure fun and comedy. A quick stop in Taupo on the way up. Definitely recommend the natural hot springs that pour in to the river just up stream of Haka Falls. Here's a quick vid of me at a jump in spot on Lake Taupo just before we got to Taupo (not connected to the hot springs). Erica and Brett's Batch. The group getting into some Avocado and Tomato entrées. Setting up hooks for long line fishing. "The Kid" guiding the line out as Warrick swims out 300 m or so with the end of the line and weight. Patenque, the drinking game version. Closest ball nominates drinks and furtherest takes drinks, plus variations. More drinking games, Beer Pong. Rated for all ages... well 18 and up. Midnight campfire on the beach. Midnight swim for Brin after losing a beer chugging contest to "the Kid". 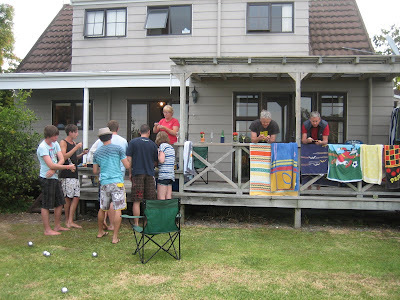 Left Langs Beach Dec 27 and stayed at Tracy's on my way to Coromandel for NYE. Went to AVATAR the movie I worked on for a couple of days in 2007. Remember the one you all asked me about, "what movie did you work on in NZ?" To date AVATAR has grossed 1.5 billion and will earned the most ever! Average story, but fantastic movie going experience. Don't miss it in 3D in the threaters! 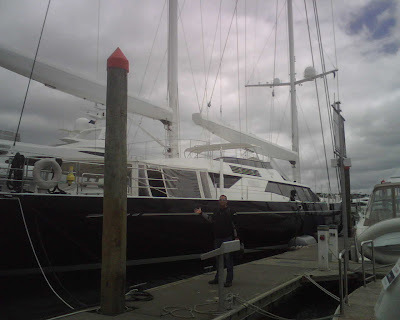 Stopped in to the Auckland harbour also to see this awesome 50 m (165ft) Super Sailboat worth 25 million euros ($35 MM USD). We spoke with a cook who couldn't tell us who owned for fear of loosing his job, but did mention it only slept 12 guests (plus 12 crew). Those rooms must be amazing. 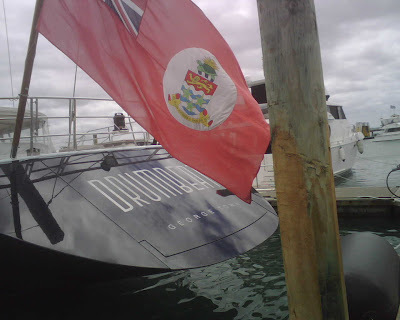 Cayman Islands flag where a lot of these boats live half the year. I think it's a tax thing. Tairua and the Coromandel. Brad Anderson and crew invited me to the batch he and Uncle Geoff arranged for 5 days up to and including NYE. Fishing with Brad, Geoff and Kerryn. Man those rocks were challenging to walk on with flip flops. I owe Brad a new weight, dammit. The NYE crew, Richie, Me, Kerryn, Benson, Sarah, James, Andrew, Brad Sr, Dwight, Lisa, Geoff, Uncle John(met for a drink) and Chris. Who's taking these incriminating photos? Sitting on the beach watching the NYE fireworks. After with live entertainment from Katia Demeester a true musician Benson found in the park on the walk home from the fire works. Best part of this picture is that no one can remember what I put in Kerryn's top? Bring on 2010. It's going to be a good one. January 2010, Marlborough Sounds Survivor!